Getting involved in an insurance claim scam, whether intentionally or unintentionally, can profoundly affect the future of a business. Mac McGregor, of course, would never consider bilking any customer be it a person or insurance company. 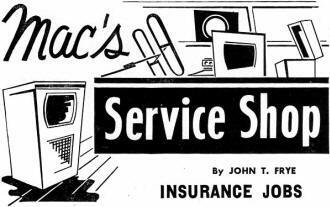 Diligent bookkeeping, annotation, and on-the-record statements from claimants seeking his repair services were in 1956 (when this story appeared in Radio & Television News) and are today the keys to covering your posterior. Also mentioned is a scheme to electromechanically make dynamic adjustments to a tape recorder's read/write head in order to compensate for minute skew angles of the magnetic tape media as it feeds through the machine. Many of the topics covered in the Mac's Service Shop episodes concern real-life products, research, or processes, so my guess is that Mac's reference to a friend applying for a patent on this tape head scheme was an actual invention. Reading about the dynamic head positioning idea reminds me of how all new giant telescopes are composed of multiple, independently mounted and servomechanically deformed hexagonal sections that move in response to perturbation measurements of the atmosphere whose scintillation effects (aka "twinkling") on images can be almost entirely cancelled so images are nearly as good as space-based instruments. Barney glanced down the workbench to where Mac, his boss, had the clock out of a clock radio and was apparently dismantling it. 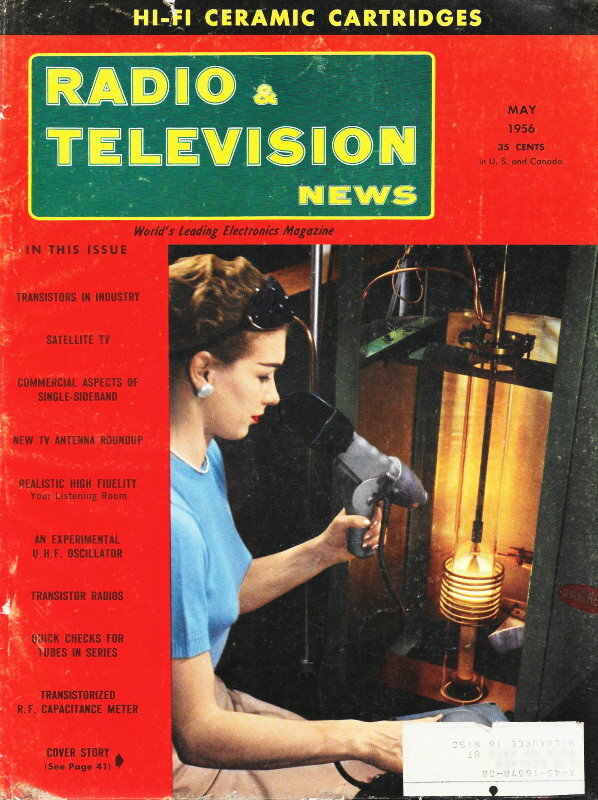 "It's not enough that we radio-TV technicians must be electricians, roof-monkeys, salesmen, and furniture refinishers," Barney said with a sigh; "now we apparently must be jewelers, too. Do you really think you can repair a clock?" "I know I can repair this one," Mac answered as he removed the motor field winding. "The only trouble with the clock is that lightning burned open this winding. I managed to get a new winding which I am now installing." "How do you know lightning did it?" "That's a good question and the same one asked by the customer's household fire insurance agent. In this case, fortunately, it was easy to answer." As he said this Mac reached over and turned the small radio chassis upside down. The capacitor that went from the line switch to the opposite side of the line was blown apart, and a large scorched area on the chassis directly below showed clearly the effect of the flash of fire that must have accompanied the "blowing" of the capacitor. "Did the clock stop at the same instant ?" "That's right. Incidentally, a new clock listed at about seventeen dollars, and that is what the distributor wanted to sell me. He said he could not furnish individual clock parts. Most clock-radio manufacturers buy the clocks as units from a clock manufacturer, and the only way the radio distributor could furnish a new coil would be to take it out of a clock he had in stock. This would leave him stuck with the rest of the clock. However, I wrote to the company that made the clock and asked them to send me a coil C.O.D., which they did for about one-tenth the price of a new clock. That's worth keeping in mind, for we are likely to get more of these burned-out-clock cases now that the thunderstorm season is starting." "The insurance company will have to pay for this job without question, but what would you have done if the clock had been out but you did not have the other visual evidence of lightning? The coil could have opened by itself, you know. There must be many similar cases in which you are the one to decide whether the repair job is on the customer or on his insurance company. How do you handle such decisions?" "To answer that and other questions that are bound to bubble out of you, let's just take a typical case right from the beginning. Suppose a customer brings in a set he says has not played since the last lightning storm. I make a note' on the tag to check for possible lightning damage. If any is found, I call the customer and ask if he has insurance. If he has, I suggest that he call his insurance company and see if they want to inspect the set. Usually they do not. They simply call me on the 'phone and ask if I think lightning did the dirty work. If I say "Yes," they take my word for it. Even when I candidly admit I cannot be sure, they often say to go ahead and repair the set and send the bill to them. Occasionally a company that does not know me will send a man around to look at the set. In this case I explain what I have found and point out any evidence of lightning's having been in the set. The decision is entirely up to him. In all of these cases, I feel that I have done my best to see that my customer receives all that is coming to him. It always surprises me to discover how many people do not realize that their insurance covers damage to their radio and TV sets from lightning." "Yeah, but what do you do with the wise guy who deliberately sets out to rook the insurance company? You know the kind I mean. They tell you that the set was damaged by lightning, slyly mention that you can pad your bill because an insurance company will pay it, etc., etc." "Fortunately we do not "run across many of those, but when one does rear his ugly head I simply reply that unless I find some evidence of lightning damage I cannot say it is an insurance loss. If the fellow wants to take his set elsewhere, he is perfectly free to do so. "And about that business of padding the bill when an insurance company is paying it: that is strictly for the birds. You can't be 'almost honest.' It is just as crooked to pad a bill for an insurance company as it is to pad the bill for a poor widow, even though you may be able to build up a better sentimental defense of one than the other. Take the case of this clock radio. We could have increased our take by several dollars if we had sold the customer a whole new clock; but by treating the insurance companies just as fairly as we do our oldest customers, we have won their confidence. Very often when the insurance agent is called in first he sends the business to us because he knows his company will get a square shake here. So, if you just want to look at the thing purely from Ben Franklin's practical point of view, honesty is still the best policy." "Is there any difference in billing and getting your money for these insurance jobs?" "I usually make out the bills in triplicate on those Dave Rice Order Book Forms. One copy goes to the customer; one goes to the insurance company; and the third stays in our files. The charges are carefully itemized, and mention is made of the fact that 'Repair of lightning damage' was performed. The insurance company ordinarily sends the check to their insured; and it often takes two or three weeks for the check to come through. That means that you must exercise a little caution in securing your pay. The best idea is to have your customer pay you when he picks up the set and to give him both his own bill and that for his insurance company marked 'Paid.' From then on the matter is strictly between him and his company. However, when the bill is pretty good size and when the customer is an old and reliable one, I do not mind waiting until he gets his check." "That's about all. The most important thing is to get an OK from the insurance company before you start any repairs. The insurance people may decide to replace the radio or TV set instead of having it repaired. In this case they will still be willing to pay you a fair amount for your appraisal of the damage." "Not to change the subject, but Sunday right after I got home from church I tried to get you on the phone two or three times, but the line was busy all the time. Was your wife on the line?" "No, I'm afraid I was the guilty one this time. A friend of mine who is in the tape-duplicating business over East called me, and we had a lengthy and most illuminating chat about some of the things he had discovered about tape recording in general while working with his particular line." "For one thing, he said that the fidelity of tape recordings made and played at comparatively slow speeds, such as 3 3/4, and 7 1/2 inches-per-second, depended chiefly on three important factors: (1) the quality of the tape, (2) the gap-size of the heads, especially the reproducing head, and (3) head alignment. He paid the tape manufacturers quite a compliment when he said he felt they had achieved about all the major improvement we could reasonably expect in that direction. Modern tape is good enough to 'take' all the fidelity required if we can just devise means of putting the signal on the tape and picking it off. He went on to say that he doubted that the gap size could be mechanically reduced much below that found in modern high-quality heads." "Hold it!" Barney interrupted. "How else could you reduce the gap size except mechanically?" "I asked about that, too, and he seems to think that possibly something could be done along the line of producing an 'electronic gap.' Candidly, I am not too clear on what he has in mind. Perhaps he means to produce the gap by some electronic lens shaping action. At any rate, substantial improvement in that direction would seem to be very much in the 'iffy' category." "That leaves only head alignment." "And that is where he thinks a lot can still be done. He tells me head alignment rapidly increases in importance as the tape speed is reduced. When he speaks of head alignment, he is not talking about just making sure the slit in the reproducing head is exactly parallel to that of the recording head. He says this is not enough. Experiments in his laboratories with first-class recorders reveal that when the heads are perfectly aligned in this respect, you can record a seven-inch reel of tape with a high-frequency tone and play it back immediately and lose several db of this signal between one end of the tape and the other. At any point, though, the loss can be recovered by changing the azimuth of the pickup head." Instead of answering, Mac marched out into the office and stripped a couple of yards of paper from the roll on the adding machine. He fed this into the typewriter and lined up the edges so the strip of paper was being fed straight through the rollers. As he continued to turn the feed roll, however, the narrow ribbon of paper began to skew, and as it finally left the typewriter it was describing an acute angle with the paper bail. "That," Mac explained, "is what happens in the tape transport system of a recorder. It is virtually impossible to insure perfectly even tension clear across the width of the tape; yet the slightest difference results in skewing as happened to the adding machine paper. Remember one edge of the tape has to lead the other by only a small fraction of an inch to seriously impair the high-frequency response." "Are better tape guides the answer?" "No. We might be able to improve this condition by using enough rollers, special tape guides, etc., but then we should end up with a complicated tape-threading mechanism that would be a great nuisance." "What is the answer then?" "My friend thinks it's a self-aligning reproducing head. He argues the thing to do is to make the head align itself to the tape. That way the tape can skew if it likes without impairing the high-frequency response in the least. In fact, he has actually patented a head that works in this fashion." "I am not sure how his works, but I have been thinking about possible ways of doing this. One would be to use a special recording head that put three tracks on the tape. Very narrow tracks along each edge would be recorded simultaneously with the same high-frequency note. The center track would be left for the music or other information that you wished to record. The pickup head, too, would be a three-part affair in which separate heads would pick up the edge-tracks and feed them to a special phase-comparing circuit. As long as the pickup head was perfectly aligned with the signal on the tape, the signals from the two edge-track heads would be exactly in step; but if the tape skewed, the signal from one head would lead that from the other by a definite amount, and this could produce a correcting voltage that could be used to exert a mechanical correcting influence on the head. The mechanical device might be a servomechanism when a slow-acting correction would be adequate, while for a more nearly instantaneous correction the electrostrictive characteristics of a crystal might be used. Since the three gaps in the recording head would be in a perfectly straight line and so would the three gaps in the reproducing head, keeping the reproducing head perfectly aligned with the edge recordings would automatically insure that the center head would be aligned with the information on the center crack." "Sounds a little fantastic, but I can't see anything wrong with it," Barney said slowly. "I'd imagine something like that would be pretty expensive, though." "Quite likely it would, but in certain industrial applications where good high-frequency response is essential, this would not be too important. Well, we had better pull our heads down out of the clouds and get to work." "I should have known better than to mention 'expense,' '' Barney said with a grin as he picked up his soldering gun.